Home > Learning Center > Energy Efficiency > How Much Energy Does an Electric Oven and Stove Use? How Much Energy Does an Electric Oven and Stove Use? From baking bread to boiling water, there's a lot your electric oven and range can do. But what's it costing you? That's one of the more complicated questions to answer when it comes to analyzing your household energy consumption. Let's end the suspense with some basic cost estimates. Most electric ovens draw between 2,000 and 5,000 watts, with the average electric stove wattage coming in at around 3,000 watts. So how much energy does an electric stove use per hour? Assuming an electricity rate of 12 cents per kilowatt-hour (kWh), a 3000-watt oven will cost you about 36 cents per hour at high heat. As for the burners on the electric stovetop, bigger burners draw more electricity. 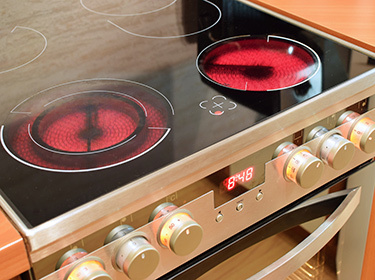 Many cooktops range from about 1,200 watts for the smallest burners to 3,000 watts for the largest, which will cost you roughly 14 cents and 36 cents per hour, respectively. But even if you know the exact wattages of your oven and each of your burners, this breakdown is a simplification. That's because the actual wattages you're drawing depend on the amount of heat you're generating. There's a big difference in energy consumption between making beef jerky at 170 degrees and self-cleaning your oven at 800 degrees. And think about how you use your burners: you quickly turn the dial to low, medium or high heat, but the exact place where the dial stops changes slightly every time. This makes it very difficult to accurately track the energy consumption of a kitchen range. Fortunately, given the rough cost estimates stated above, these differences won't amount to more than a couple of dollars per month for the average home cook. Unless you keep your range running all day, every day, it's not going to break the bank. The task of estimating an electric range's energy consumption doesn't get much easier when you're shopping for a new model. The federal ENERGY STAR program, which helps consumers identify energy-efficient models when shopping for many appliances, doesn't evaluate ovens and ranges. In addition, the yellow and black EnergyGuide labels that feature cost estimates for the use of appliances like refrigerators and dishwashers are also not available for ovens and ranges. Check the wattage of the oven and each individual burner. Lower wattages mean lower energy use, but this is a tradeoff: it also means less heating power. Choose a convection oven. This feature might cost more upfront, but a convection oven can cook dishes faster and at lower temperatures. Choose an induction cooktop. This adds even more to the purchase price of a range, but an induction cooktop saves energy by using electromagnetic energy to generate heat, and it's a safer option because the cooktop always stays cool to the touch. Choose a self-cleaning oven. These ovens require extra insulation due to the high heat of the self-cleaning cycle, and that makes them more efficient overall. Switch to gas. If you're shopping for an electric range, that's probably because you don't have gas hookups in your kitchen. But if natural gas is available in your area and installing gas connections isn't prohibitively expensive, switching to a gas range will give you an automatic energy efficiency boost. Cook more food less often. It's more energy-efficient to cook multiple dishes at once, so plan your cooking accordingly and make it a marathon. Use your microwave to heat up the leftovers at a fraction of the cost of using your oven or stovetop. Keep the oven door closed. You lose heat energy every time you open it, so use the oven light and look through the window instead. Clean your oven and range regularly. Baked-on gunk acts like insulation on top of your heating elements, robbing you of cooking efficiency. Use glass and ceramic bakeware instead of metal pans. They transfer heat more effectively and evenly. Get a head start on self-cleaning. Start the cleaning cycle right after using the oven to cook, and you'll shave several minutes off the cycle length.